are YOU kidding me, 4 Gaming Consoles? Nope, not kidding! YES up to four online Gaming Consoles like a mix of Xbox's and/or PlayStation's – all playing at the same time - inside your private network - with absolutely no negative impact to ALL other active Internet activities for everyone else in your family - up to a maximum mix of 25 internet enabled devices. Secure wireless and wired home network for your multi-player Gaming Consoles like Xbox's or PlayStation's effectively isolated and » very kwl « actually working properly enabled by our very special EdgeRouter impenetrable Firewall Network Configuration and - now IPv6 enabled - Xbox One uses ipv6 by default consequently much superior gaming experience. Many people with Wi-Fi knows the agony of too many devices competing for too little bandwidth. A typical home scenario might include Netflix streamed on the large living room HDTV, a few Skype, Facetime or other video chat sessions running on smartphones or tablets while a heated game of Team Fortress is played with a live audio link to other team members. In most households, this scene is likely to have at least one person yelling for someone else to get off the internet! Our High Performance network system solves this problem by utilizing an intelligent Quality of Service process and Airtime Fairness mechanism for wireless users that quickly prioritizes your network traffic so that everyone YES everyone will be pleased with their online network experience. In addition to your Xbox and/or PlayStation Gaming Consoles, excellent for all your iPhones, iPads, iPods, Apple TV’s, Roku’s, Laptop computers, Desktop computers, Notebooks, Android devices, networked Printers, Smart T.V.’s, Voice over IP Telephone services, Smart Home monitoring systems. For this GP4 system specific implementation you can securely utilize up to a maximum mix of 25 internet enabled devices. Game players can play without impacting any activity that other family members or guests may need to use, like watching Netflix, YouTube, internet shopping, internet banking, making and receiving internet phone calls, participating in webinars or any other online conferencing events, downloading large files, etc. 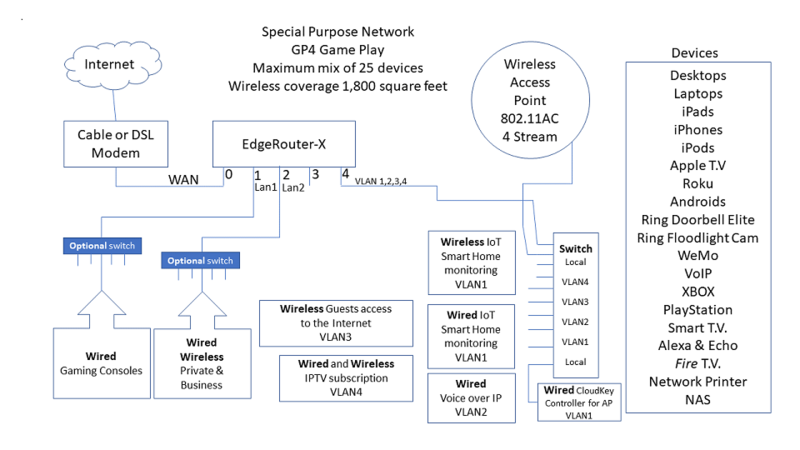 Up to 25 devices on this network system will » respond « much faster'; devices like desktops, laptops, workstations, Apple iPhone's, Apple iPad's, Apple TV, Roku Streaming, Android Phone's, Android devices, Microsoft Windows gear, Google Home, Amazon Alexa, Network Printers, Network Storage Devices, Network Security Cameras, all smart devices. For this GP4 system specific implementation you can utilize up to a maximum mix of 25 internet enabled devices. non-refundable deposit $1,300 required, balance on install completion and Client sign-off.